Ebe Niger no n'ime Afrịka. Niger bu obodo no na Afrịka. O no n'elu Naigeria na Benin. 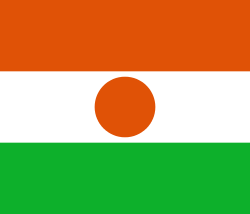 Isi oche Niger bu ebe ana-kpo Niamey. 1 Partly no n'ime Asia. 2 Mostly no n'ime Obodo Békè. 3 Includes the dependencies of Saint Helena, Ascension Island na Tristan da Cunha.